Ipswitch WhatsUp® Gold Total Plus Edition is powerful, easy to try, buy and use software for unified application, server and network monitoring and configuration management. WhatsUp Gold Layer 2/3 Discovery identifies all of the devices on your network including your routers, switches, servers and more. WhatsUp Gold features Seed Scan technology which discovers all devices on the network by automatically learning your network topology. It can also discover the network using an IP Range Scan, from a Start and End IP Address and discovers all port-to-port connectivity and network dependencies. WhatsUp Gold automatically generates Layer 2/3 network maps of your core infrastructure, Windows® infrastructure, servers, printers and more. The unique interactive network map displays your entire IT environment from end-to-end, quickly showing the status of every device and letting you see your end-to-end network health at a glance. Network administrators can click on any device to instantly display its status, properties and assigned monitors, or they can drill-down to dashboards displaying detailed performance data. WhatsUp Gold continuously monitors the availability and performance of your infrastructure from routers, switches, and firewalls through to your servers, storage devices, applications and virtual machines. In short, WhatsUp Gold can monitor anything with an IP address that can be accessed with standard monitoring protocols including ICMP, SNMP, WMI, and SSH. WhatsUp Gold provides turnkey Application Profiles that let you easily monitor availability performance of popular Microsoft applications such as Exchange, SharePoint®, Dynamics, Lync®, SQL Server®, DNS, Internet Information Services (IIS), Active Directory® and Hyper-V® as well as Linux systems and Apache web servers (Linux or Microsoft based). You can also easily create profiles for your in-house applications with an easy-to-use profile tool. WhatsUp Gold collects flow records using Cisco NetFlow, NetFlow-Lite and NSEL, Juniper J-Flow, sFlow, and IPFIX protocols for extensive multi-vendor networks. This allows you to optimize network performance, isolate network traffic anomalies and bottlenecks and establish bandwidth usage policies. WhatsUp Gold monitors, alerts, and reports on interface traffic and bandwidth utilization. It provides detailed and actionable data on the top senders, receivers, conversations, applications, and protocols consuming network bandwidth. 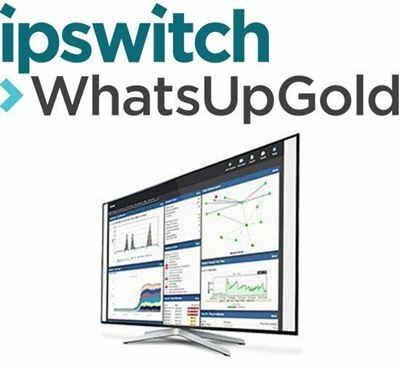 WhatsUp Gold discovers, maps, monitors, alerts and reports on VMware performance for ESX and ESXi hosts and guests in real-time. It keeps an up-to-date list of all VMware hosts and attributes. It monitors the performance and resource consumption of hosts and guests, including CPU, Memory, Disk and Interface Utilization via the vSphere API. It monitors the availability and performance of VMware vCenter servers and collects vCenter event logs. WhatsUp Gold automates configuration and change management for the routers, switches and firewalls on your network. It archives and audits network configurations, and alerts and reports on any changes. Network Administrators can ensure that all devices are running authorized configurations to secure the network and comply with regulatory standards. This reduces the time and costs associated with manual and repetitive configuration and change management tasks. Regular audits can be scheduled to run on network devices in order to prove compliance with archived configurations with out-of-the-box configuration templates. WhatsUp Gold provides real-time alerts via email, text, and logging. Alerts empower you to proactively respond to problems before they impact users, applications and the business. WhatsUp Gold issues an alert when a device or monitor changes state (e.g., from an up state to a down state) or when a performance threshold is exceeded – for example, when memory utilization exceeds 75 percent. WhatsUp Gold’s “smart” alerting uses the network dependencies automatically identified in the discovery process to eliminate alert storms and quickly identify the root causes of network problems. The WhatsUp Gold Alert Center displays threshold-based alerts in a single dashboard. You can create action policies for alerts including event logging, email, texting, and automated self-healing actions such as restarting an application service. WhatsUp Gold even allows you to respond to issues with automated network configuration management actions like backing up or restoring a network device configuration. WhatsUp Gold delivers an easy-to-customize reporting environment. You can select from hundreds of out-of-the-box views or create high-level, summary dashboards that provide a quick assessment of overall IT health – even detailed drilldown dashboards to isolate the root causes of performance problems. These dashboards can help you quickly resolve performance problems across your organization.WhatsUp Gold also features integrated inventory reporting including hardware inventory, reports on installed software and updates, warranty reports, and more. These reports save both time and money and can decrease year-end IT inventory activities from weeks to minutes. The reports will also help you find under-utilized hardware resources that can be re-deployed and identify unlicensed software to avoid expensive true-up costs. WhatsUp Gold Failover ensures high-availability operation for your WhatsUp Gold server. This allows you to setup automatic failover that can be based on specific event occurrences or conditions that can trigger a failover to a backup server. If you need more flexibility and control, a failover can be initiated manually for scheduled maintenance or planned outages and downtime. WhatsUp Gold extends your visibility by monitoring distributed networks and including ten scalability pollers. This extends your network monitoring capabilities to let you monitor devices on networks segmented across multiple geographic locations. Now it is easier to support larger and more geographically diverse networks. WhatsUp Gold also provides users with out-of-the-box centralized reports for remote sites for proactive network monitoring across a distributed environment. System requirements can be found in the WhatsUp Gold release notes.